‘Young Parrotfish’ Clean Algae From Manatee | Marine Life Society of South Australia Inc.
My ongoing study of fish cleaners and cleaner fish continued recently when I caught the last ¾ of “Atlantic: The Wildest Ocean on Earth” (Season 1, Episode 3) on Channel 9 TV recently. I had missed the first 15 minutes of the program but settled down to watch the remainder of it when I saw that it featured much marine life and underwater footage. The program soon featured a manatee which then got cleaned of algae by ‘young parrotfish’. Yes, I realise that manatees are not found in South Australian waters, but I am interested in the fish cleaning or cleaner fish aspect. 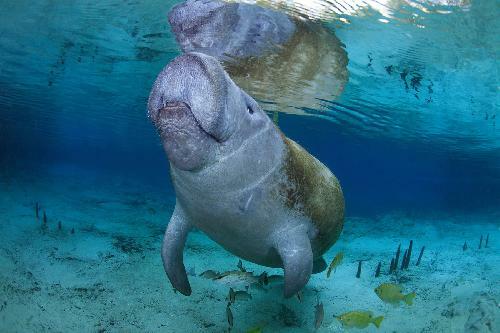 According to Wikipedia, Manatees (family Trichechidae, genus Trichechus) are large, fully aquatic, mostly herbivorous marine mammals sometimes known as sea cows. I unsuccessfully tried finding some information online about manatees and cleaner parrotfish. I did, however, manage to find a photograph at https://www.telegraph.co.uk/news/earth/wildlife/7319914/Manatee-gets-haircut-from-gill-fish.html . It showed a manatee surrounded by little fish (blue gill fish?) “eating algae, parasites and dead skin”. A search for actual footage of “Atlantic: The Wildest Ocean on Earth” (Season 1, Episode 3) was successful when I found what I was looking for at https://www.bing.com/videos/search?q=%22atlantic%3a+the+wildest+ocean%22&&view=detail&mid=9A06C5305B2AFECD68539A06C5305B2AFECD6853&&FORM=VRDGAR . I was able to watch the complete program online. The manatee was first featured at about 7 minutes into the program, a section that I had initially missed on TV. The actual bit about a manatee being cleaned of algae by ‘young parrotfish’ featured at about 20 minutes into the program. That’s about all that I have to say on the “‘Young Parrotfish’ Clean Algae From Manatee” matter, but I may as well mention a newspaper report in today’s Sunday Mail. « How relevant is MLSSA?